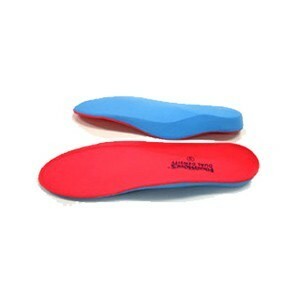 Combines a layer of low density Polyethylene foam (light red) over a more firm functional Blue base. Suitable where additional cushioning required. Excellent for use in multi-directional sports such as tennis, baseball & basketball, reducing forefoot pivoting irritation and more. Ready to fit, lightweight and flexible material can be customized for great comfort. 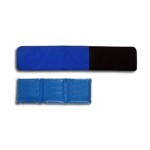 Made from 100% closed cell polyurethane, keeping a uniform density throughout the insole, regardless of the thickness. Milled and ground to only 2mm depth in forefoot to avoid bulking up in the shoe. Contains Ultrafresh, an effective antibacterial and anti-fungal agent. Will not absorb sweat or harbor bacteria. Will keep its unique personal molded shape until it is re-heated. Available in six sizes: XS (Women´s 5.5-7) SM (Women´s 7.5-9) (Men´s 6.5-7.5) MED (Women´s 9.5-10.5) (Men´s 8-9) LG (Women´s 11-12) ( Men´s 9.5-10.5) XLG (Men´s 11-12.5) XXL (Men´s 13-15) Please contact Water and Sports Physical Therapy,Inc. for more information on how to customize yourself or to schedule a professional customizing by one of our licensed Physical Therapist.